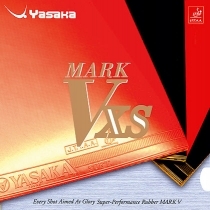 The Mark V “family” rubbers are famous among top players all over the World. The aim when developing MARK V XS is to offer a rubber with superior spin characteristics without loosing too much speed. The way the Yasaka technicians succeeded is. The result is D.A.T., Double Accelaration Technology, which gives the rubber extremely strong spin possibilities and good speed.